Raising renewable energy’s share of world energy production will have broad, positive and long-lasting effects on national economies and societies, according to a study from the International Renewable Energy Agency (IRENA). 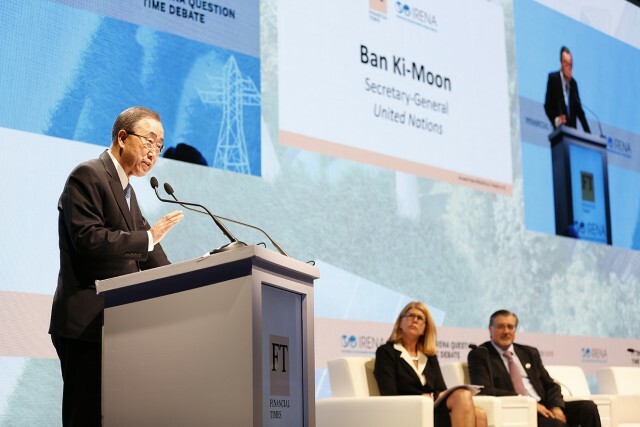 The report was released January 16 as some 500 government officials, renewable energy industry and civil society leaders gathered at IRENA’s headquarters in Abu Dhabi to craft strategies to achieve the greenhouse gas emissions (GHG) reductions agreed to at the historic UNFCCC climate conference in Paris in December. Boosting renewable energy capacity to 36 percent by 2030 would raise global GDP 1.1 percent, to $1.3 trillion, IRENA concludes in the report, ¨Renewable Energy Benefits: Measuring the Economics.¨ Furthermore, Abu Dhabi-based IRENA concluded that boosting renewable energy’s share of the global energy mix to 36 percent by 2030 would have 3-4 times that beneficial impact in terms of social welfare, including employment and environmental health. In addition to a global perspective, IRENA drills down and examines the impact boosting renewable energy would have on individual national economies in its report. Raising renewable energy’s share of Japan’s energy mix would raise its GDP 2.3 per cent, the highest among the nations studied. The economies of Australia, Brazil, Germany, Mexico, South Africa and South Korea would see gains of more than 1 per cent. 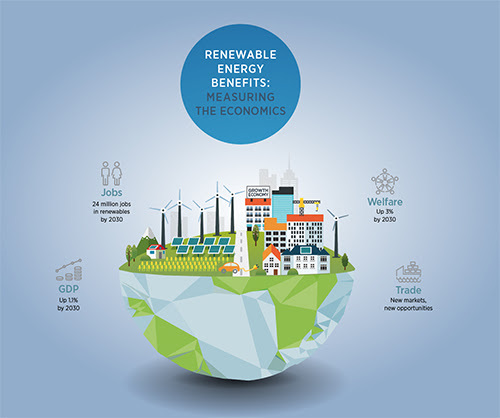 In addition to spurring economic growth, raising renewable energy’s share to 36 percent of the global energy mix would yield improvements in social welfare and environmental health and quality that would go far beyond GDP, according to IRENA. Social welfare metrics would rise 3.7 percent and renewable energy sector employment would increase from 9.2 million today to more than 24 million by 2030. Trade patterns would also shift. Global imports of coal would be cut in half or more, while corresponding declines in oil and gas imports would result. That would give a substantial boost to nations, such as Japan, India, Korea and E.U. countries, who rely heavily on them. Fossil fuel exporting nations would benefit as well, however, IRENA says. For its part, IRENA joined with the Abu Dhabi Fund for Development (ADFD) in announcing they were extending $46 million in concessional loans to develop up to four renewable energy projects in developing countries. The funds would finance development of solar and wind power farms in Antigua & Barbuda, Burkina Faso, Cabo Verde and Senegal. Collectively, they would generate 12-MW of renewable energy capacity, reduce emissions, create jobs and serve as reliable, affordable sources of electrical power to rural communities currently lacking them, IRENA explained in a press release. ADFD Director General Saif Al Suwaidi noted that financing the developing country solar and wind farms advances the U.N.’s Sustainable Development Goals (SDGs), the strategy blueprint that succeeds the U.N. Millennium Development Goals (MDGs). “Increased availability of clean, affordable and reliable energy is an important priority for ADFD to drive sustainable development and positive societal changes across developing countries,” Al Suwaidi stated. “Our collaboration with IRENA has significantly contributed to narrowing the energy divide that has long hindered development projects in developing countries due to the lack of reliable power infrastructure.